Would You Rather Questions make great discussion starters and writing prompts. Kids LOVE them and they are also a great exercise in critical thinking since they require students to weigh two options against each other, select the best one, and justify the answer. 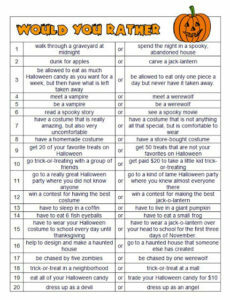 Here are 20 Halloween-themed Would You Rather Questions to use with your students!